Every morning, there are queues. Before the sun has risen high enough to clear the skyscrapers that surround Times Square, while teams from the Times Square Business Improvement District are still scraping and washing the pedestrian plazas, there are lines at Broadway’s box offices. These are not the lines of bygone days, the morning or the week after rave reviews sent people scurrying to snap up tickets. Digital sales have largely eliminated those queues, as people buy and print their tickets at home. 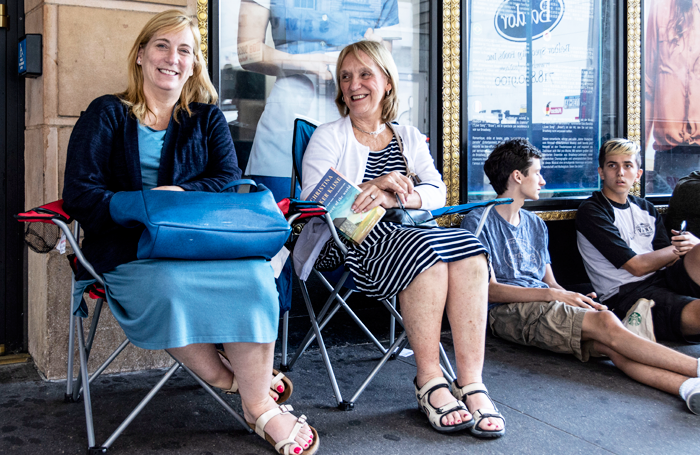 The people standing, kneeling, and sitting in a line in front of Broadway’s theatres, in folding chairs or even sleeping bags, are waiting for individual box offices to open at 10am. They are there to snap up inexpensive rush seats, or standing-room-only tickets, for that day’s show. I pass these lines on the way to my office every morning. As someone whose discount ticket purchases run to online ticket discount codes or the venerable Theatre Development Fund TKTS booth, now located under the red steps of Duffy Square, I’ve wondered who these hardy souls might be. I have a general aversion to queuing up in general. I haven’t the patience – or these days the lower-back strength – for it. My curiosity, long piqued, finally peaked last week, and I set out to undertake a highly unscientific sampling of these line-standers. Observing on Wednesday at 9am, the lines were fairly long, due no doubt to a two-performance day (almost all Broadway weekday matinees are on Wednesdays) and the relatively short wait between the opening of the box offices and the first performance. Two days later, when I approached the first people in multiple lines – for shows between 47th and 44th Streets, on the west side of Broadway – I noticed that the queues were much shorter. At Waitress, Michelle Unger of Long Island said she and her mother had arrived at 6am to claim their prime position. Why? “My daughter is dying to see the show, and she’s still sleeping. Grandma and I got up to get the tickets.” It was the third show that week that Unger had waited in line for, in specially purchased $7 folding chairs. In honour of her mother’s weeklong visit, the three generations had already seen Come from Away and Hello, Dolly!. Previous rush ventures had yielded tickets to Mean Girls and Anastasia. 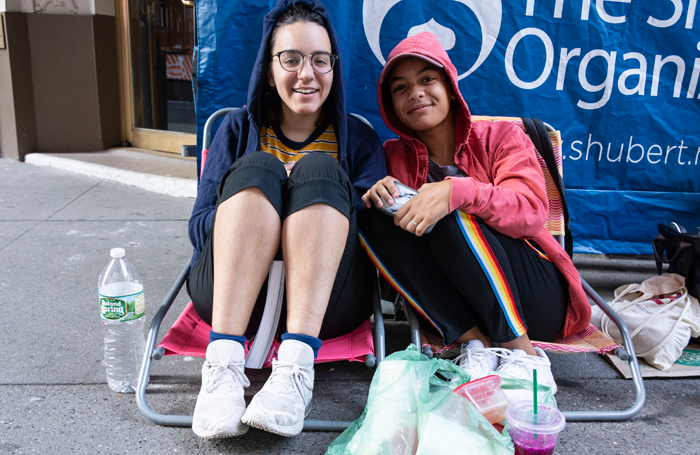 A trio of friends – Andrea Trudel of Montreal, and Connor White and Stina Pinsky from Brooklyn – were first in line for The Band’s Visit, a show White had already seen 10 times and Pinsky had seen eight. “We come for the understudies,” said White. Trudel, who said she had never waited for rush seats before in the US or Canada, would be marking her third Band’s visit. The friends said they had arrived at 6:30am to claim their spot. They noted that during the run of Natasha, Pierre, and The Great Comet of 1812, they typically arrived closer to 5am. 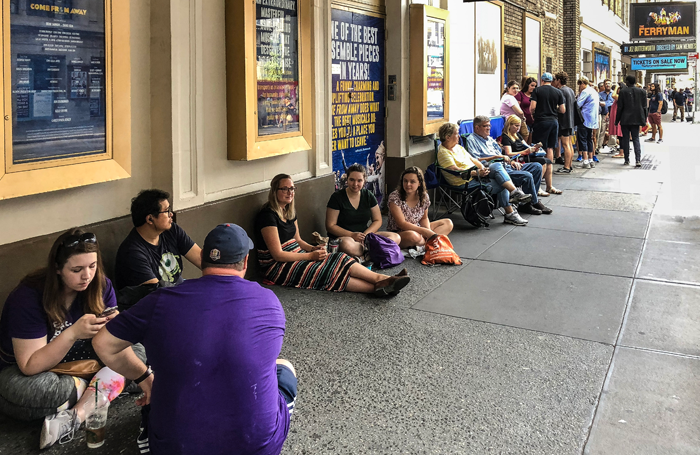 As someone who regularly inveighs against the steady rise in Broadway ticket prices, there’s something very heartening in spending time with the line-standers. They are absolutely fans of Broadway, regular theatregoers and, to varying degrees, knowledgeable about what they want to see. They are quite willing to invest four to five hours to secure tickets that cost between $20 and $40 each – far below the average price, which exceeded $100 several years ago and can be many hundreds of dollars for shows such as Hamilton and Springsteen on Broadway. My conversations were brief and few, so I would be foolish to extrapolate trends, but I was surprised to find out from my chats with those who were first in line, most early birds were locals – not the tourists who we’re told drive Broadway, and that one of the visitors I did find is an arts professional in his own country. Even in five-minute snippets, it was vivifying to speak with those I would call real theatregoers, who exist outside the professional bubble I entered many years ago. 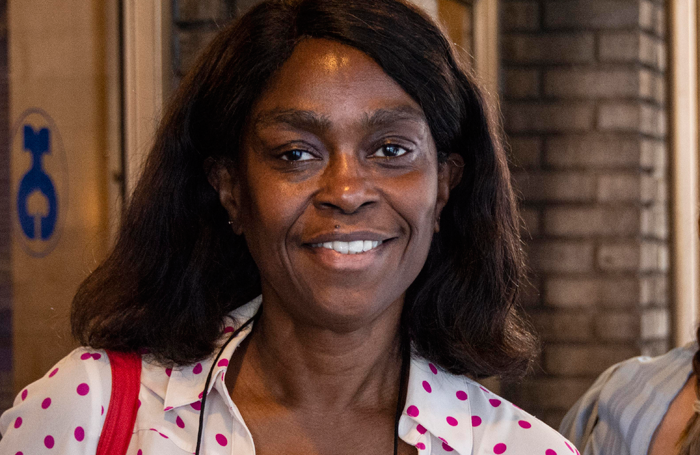 I would urge others in the field to stop and say hello to the line-standers and find out who they are and why they’re there – not as market research, but rather as a means of reconnecting with the spirit that brought us all into theatre years ago. While I was burdened with a hand recorder and a camera, professional visitors to the queues might also think about bringing over a few coffees, or perhaps a box of doughnuts, by way of thanks for the commitment being demonstrated. Better still, offer to hold someone’s place in line for a few minutes, so they can have a restroom break. After all, four hours can seem a very long time.